The Level 2 tool kit includes an ETA 2836-2 Nickel Plated with 25 jewels Swiss Made Movement ($239.00), Novodiac shock spring, with the stop lever (hack); four hand oilers (FB-903 $10.95); Moebius Syntalube 9010 (FB-917 $27.60); Moebius 8141 (FB-929 $16.95); Moebius D-5 (FB-916 $39.00); Moebius 8217 "Glissalube 20" (FB-930 $32.50); PML Grease (FB-932 $18.95); Bergeon four cup oil stand (FB-914 $128.00); one 23 mm Bergeon cleaning basket (FB-312 $29.00); two bars of Rodico (FB-309 $9.76); If these items were purchased individually the current cost would be $551.71. There are several optional items for Level 2 students. These items should be ordered separately and can be ordered at any time. Please see the Watch School "News" page for a description of the items. The Level 2 tool kit with case style #1 ETA 2836-2 movement with 25 jewels Nickel Plated, Novodiac shock spring, with a stop lever (hack) ; four hand oilers; Moebius Syntalube 9010; Moebius 8141; Moebius D-5; Glissalube 20 (8217); PML grease; Bergeon four cup oil stand (FB-914); one 23 mm Bergeon cleaning basket; two bars of Rodico; one Style #1 Case 100% Stainless Steel, with a see-thru mineral glass top and bottom back and screwdown crown. : Supplied with crown, hour, minute, sweep hand and two dials. There are several optional items for Level 2 students. These items should be ordered separately and can be ordered at any time. Please see the Watch School "News" page for a description of the items. A hand setting tool is well worth the investment. 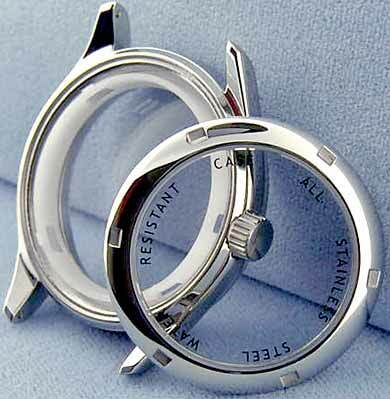 Sapphire Case Style #1 now has a Screwdown Crown with Sapphire Glass on both the top and bottom on this 100% Stainless Steel see-thru back case. 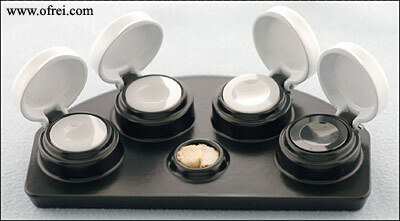 Case has Anti-reflective Coating on the inside of top crystal. The bottom crystal does not have anti-reflective coating. 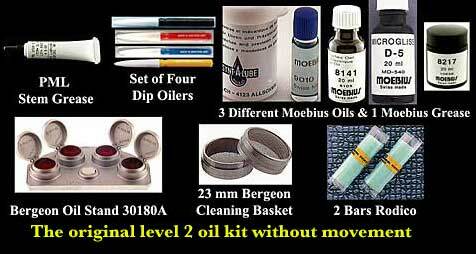 This kit is supplied with all the items found in the Original Level 2 Toolkit. The Level 2 tool kit includes four hand oilers (FB-903 $10.95); Moebius Syntalube 9010 (FB-917 $27.60); Moebius 8141 (FB-929 $16.95); Moebius D-5 (FB-916 $39.00); Moebius 8217 "Glissalube 20" (FB-930 $32.50); PML Grease (FB-932 $18.95); Bergeon four cup oil stand (FB-914 $128.00); one 23 mm Bergeon cleaning basket (FB-312 $29.00); two bars of Rodico (FB-309 $9.76); If these items were purchased individually the current cost would be $312.71. These mini-scale versions of the watchmakers workbench are compact and portable to fit in small spaces. 9 storage drawers, center drawer is lockable. Railing prevents items from falling off the back or sides. 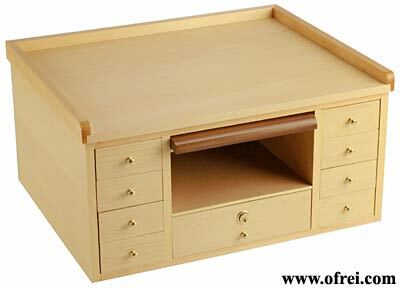 A center pull-out shelf. Size 20" Wide x 16" Deep x 10" High (51 x 41 x 25 cm). Shipping weight of item is 35 pounds. Due to the weight and size of the item, we recommend that our domestic customers choose Ground shipping to save on shipping cost. 11.5 ligne, 25 jewels, Incabloc Novodiac shock protection, automatic, sweep seconds, day and date at 3 o'clock. This is the real thing, 25 jewels and complete with the stop lever (hack). The ETA 2836-2 is the watch movement that the Time Zone Level School Level 2 lessons are based on. The ETA 2824 & 2836 join the list of popular yet hard to get ETA movements that can now come in different all the time. Our supply is always changing and adding a page just for these movements should help. 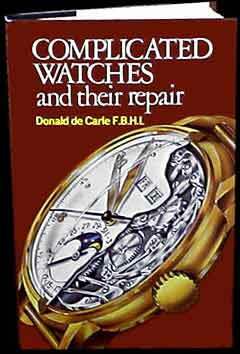 Complicated Watches and their Repair by Donald de Carle F.B.H. This is the book Donald wrote to cover automatic and day/date calendar watch repair. Since, today just about every mechanical watch is an automatic watch and has a calendar function this is a book you should have.